This page covers the author of Nothing to Declare: Memoirs of a Woman Traveling Alone. For other authors named Mary Morris, see the disambiguation page. Chicago native Morris tells us how she returned (again and again) to her roots to research and write her new novel that captures the atmosphere and dazzling music of the Jazz Age in Chicago. Fellow author and Chicago native Peter Orner calls the book “An exquisite love letter to her hometown and yet a book that transcends time and place.” Ms. Morris will also be in town for the Printers Row Lit Fest, where she will be interviewed by Chicago Tribune jazz critic Howard Reich on June 6. Meet her here first! Event co-sponsored by the Glencoe Public Library. In the midst of boomtown Chicago, two Jewish families have suffered terrible blows. The Lehrmans, who run a small hat factory, lost their beloved son Harold in a blizzard. The Chimbrovas, who run a saloon, lost three of their boys on the SS Eastland when it sank in 1915. Each family holds out hope that one of their remaining children will rise to carry on the family business. But Benny Lehrman has no interest in making hats. His true passion is piano—especially jazz. At night he sneaks down to the South Side, slipping into predominantly black clubs to hear jazz groups play. One night he is called out and asked to "sit in" on a group. His playing is first-rate, and the other musicians are impressed. One of them, the trumpeter, a black man named Napoleon, becomes Benny's close friend and musical collaborator, and their adventures together take Benny far from the life he knew as a delivery boy. Pearl Chimbrova recognizes their talent and invites them to start playing at her family's saloon, which Napoleon dubs "The Jazz Palace." But Napoleon's main gig is at a mob establishment, which doesn't take too kindly to freelancing. And as the '20s come to a close and the bubble of prosperity collapses, Benny, Napoleon, and Pearl must all make hard choices between financial survival and the music they love. 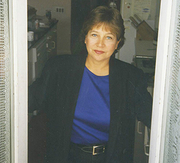 Mary Morris's novels include Revenge, Acts of God, House Arrest, The Night Sky, and The Waiting Room. She has also authored two collections of short stories and written extensively on travel, including four memoirs of her solo journey. She lives in Brooklyn, New York with her husband and daughter and teaches writing at Sarah Lawrence College. Mary Morris visits Harold Washington Library to discuss launch her new novel Jazz Palace, which brilliantly captures the dynamic atmosphere and the dazzling music of the Jazz Age. In the midst of boomtown Chicago, two Jewish families have suffered terrible blows. The Lehrmans, who run a small hat factory, lost their beloved son Harold in a blizzard. The Chimbrovas, who run a saloon, lost three of their boys on the SS Eastland when it sank in 1915. Each family holds out hope that one of their remaining children will rise to carry on the family business. But Benny Lehrman has no interest in making hats. His true passion is piano—especially jazz. At night he sneaks down to the South Side, slipping into predominantly black clubs to hear jazz groups play. One night he is called out and asked to "sit in" on a group. His playing is first-rate, and the other musicians are impressed. One of them, the trumpeter, a black man named Napoleon, becomes Benny's close friend and musical collaborator, and their adventures together take Benny far from the life he knew as a delivery boy. Pearl Chimbrova recognizes their talent and invites them to start playing at her family's saloon, which Napoleon dubs "The Jazz Palace." But Napoleon's main gig is at a mob establishment, which doesn't take too kindly to freelancing. And as the '20s come to a close and the bubble of prosperity collapses, Benny, Napoleon, and Pearl must all make hard choices between financial survival and the music they love. Mary Morris lives in Brooklyn, New York with her husband and daughter and teaches writing at Sarah Lawrence College. "Mary Morris" is composed of at least 6 distinct authors, divided by their works. You can edit the division. Mary Morris is composed of 7 names. You can examine and separate out names.